Magical Blogorail Red - St. Patrick's Day! Welcome to those of you joining me from Magical Mouse Schoolhouse and those of you just hopping aboard. I am the 4th stop on our Magical Blogorail. You know, for someone that doesn’t do a whole lot of drinking, the idea of celebrating St. Patrick’s Day with green beer and other alcoholic beverages just doesn’t do much for me. So when I volunteered to join the Magical Blogorail Red team this month, I guess I wasn’t really thinking it through very well when the subject is St. Patrick’s Day! Still, I gave it considerable thought, and in the course of that thinking, came up with what I think is a fun way to celebrate St. Patrick’s Day at Disney — or even a way to celebrate just being at Disney, even if it’s not St. Patrick’s Day! Let’s go to all four parks in one day and see what we can find that is green! So who’s up for a little challenge? My little game is to see what we can find at each of the parks that is green, and to experience something at that park, such as a ride or a show, that showcases something of the color green in it. For starters, let’s take a look at the Magic Kingdom! As you can see, Mickey has lovely green plants and grass to fit the bill for our easy challenge — and for some of the attractions, you’ve got It’s a Small World, Peter Pan’s Flight, and on and on that will feature the color green in them. Heading to Animal Kingdom Park, take a ride on Kilimanjaro Safaris to get your green! 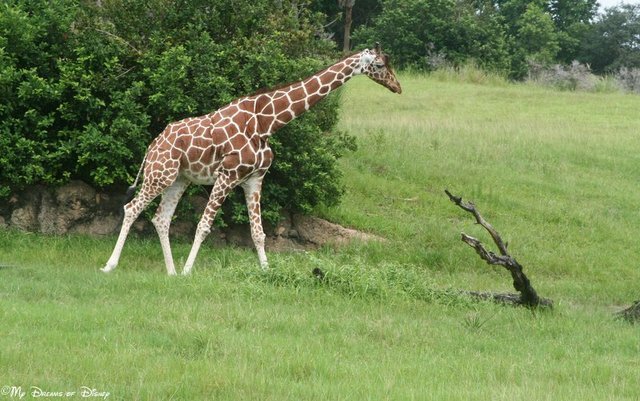 Of course, the Animal Kingdom will probably have the most green in evidence — one stop at Kilimanjaro Safaris will take care of that requirement! 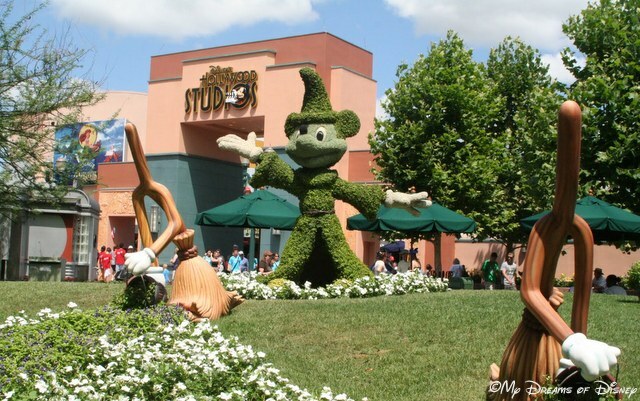 At Disney’s Hollywood Studios, Sorcerer Mickey is showcased in green! 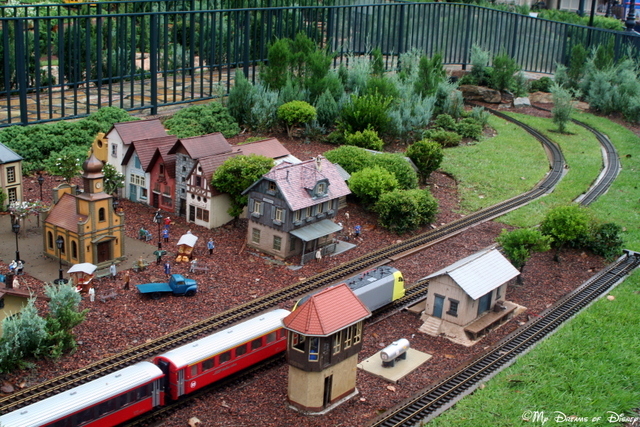 Germany and it’s train layout feature some great green features! 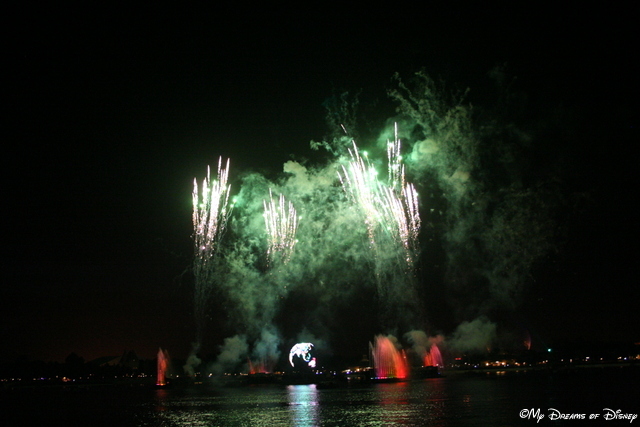 Green lights up the sky in Illuminations, Reflections of Earth. So it’s not your typical St. Patrick’s Day post, but I hope you had fun with it and maybe got some ideas for a celebration of your own — even if you aren’t visiting on St. Patrick’s Day! Great ideas on celebrating St. Patrick’s Day without focusing too much on the drinks! If you’re in the UK Pavilion at Epcot, you can also catch some Irish-inspired bands occasionally. We were there in January and the band was rocking the kilt look! Thanks, Tricia! Great post, and thanks for the tip! Next Post: Starting Tomorrow – My Disney World Countdown!